I'm feeling very unmotivated at the moment so it’s just a simple NOTD from me today. I'm just over everything at the moment so I thought some glitter would help lift my mood! I decided to use OPI Show It and Glow It! from the Burlesque collection for a full manicure. I used it in my NYE manicure for one nail but it's so gorgeous it definitely deserves a full mani! I LOVE glitter and I’m sure a lot of you do too! OPI outdid themselves with these glitters I think – they are so beautiful and are soooooo glittery. Show It and Glow It! 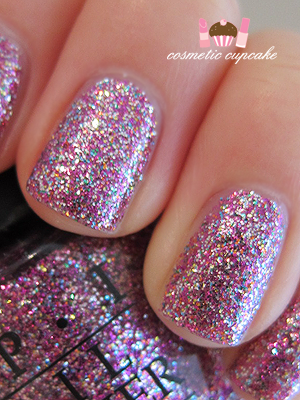 is a gorgeous fuchsia glitter packed with lots of different coloured glitters. I was hoping to get away with fewer coats of Show It and Glow It! by using 1 coat of Misa High Waist Hue as a natural base but I still ended up using 3 coats for full coverage which is pictured. The glitter dries very quickly but to a slightly rough finish so I topped it with a coat of Poshe topcoat. The wear wasn't very good for me - it started to chip by day 2. The below close up pic isn’t the best but it was the best macro shot I had of this polish. I took this quick pic when I did my NYE mani and it just shows the different coloured glitters so well! What's your favourite glitter polish? ♥ Love at first sparkle! I love glittery nail polish! That color looks so good on you, great blog!! This is such a happy glitter! !I love it. I can't pick a favourite glitter.Or holo. If it shines, it's a favourite! 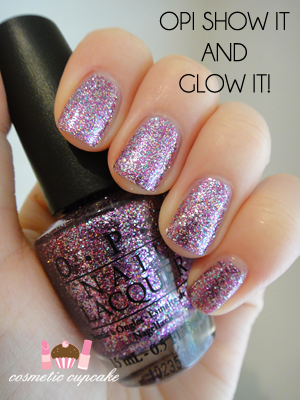 This is one of the most awesome glitter polishes I know! This is lovely! I need thisss!! I haven't got any of the Burlesque collection yet but this one is at the top of my list. So pretty! OH MY GOODNESS so prettyyy! hi there i tagged you for the stylish blogger award. I just gave you "the Stylish Blogger Award"
to pass on the award! @meipinggg: LOL it is rather shiny isn't it? Ohhh I'm honoured I can create lemmings for you! @Jennifer: Thank you for pointing that out to me Jennifer!! I'm totally blown away by all the support. I can't believe I'm at 800! @Savannah: That's an excellent way of putting it Savannah. I think I fell in love with Show It and Glow It! from the 1st swatches I saw of it! @Aysh: Thanks Aysh! I loooove glitter. Hope you did a mani using the GOSH! @Chris: Thanks so much Chris =) I enjoyed the mani while it lasted! @Charlie, Feminine Bravery: I have that one too! I must use it soon as well hehe. @Ria: LOL I totally agree Ria. Every glitter and holo polish is always so pretty! @Katrina: I think the removal process turns most people off from using glitters regularly. I know I don't wear glitters as often as I'd like because of this =p You must try it soon though! @Alice: I love these glitters too =) OPI did an awesome job on the Burlesque collection! @Sylvia: I couldn't agree with you more! @Mez: LOL I had a Veruca Salt moment when I 1st started seeing swatches of these. SO MUCH GLITTERY GOODNESS! @Danielle: All the glitters from Burlesque are pretty but the pink in this just makes it oh so pretty. Hope you get your hands on it! @Violet: I'm glad you like it Violet! Glitter polishes are great to have in your collection as they are just so much fun and very pretty too. @Tsiisfamke: Thank you for the award! @Jackie S: I wish I had done this mani for NYE. It definitely would have put me in a party mood! @Marika xoxo: Thank you for the award!